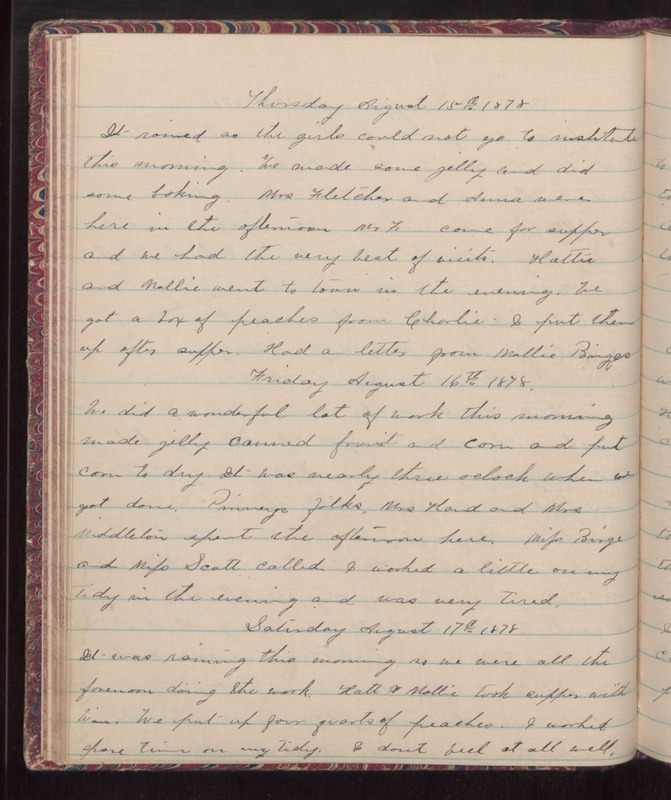 Thursday August 15th 1878 It rained so the girls could not go to institute this morning. We made some jelly and did some baking. Mrs Fletcher and Anna were here in the afternoon. Mr F. came for supper and we had the very best of visits. Hattie and Mollie went to town in the evening. We got a box of peaches from Charlie. I put them up after supper. Had a letter from Mollie Briggs. Friday August 16th 1878 We did a wonderful lot of work this morning made jelly canned fruit and corn and put corn to dry. It was nearly three oclock when we got done. Prinneys folks, Mrs [Hond?] and Mrs Middleton spent the afternoon here. Mifs Binge and Mifs Scott called. I worked a little on my tidy in the evening and was very tired. Saturday August 17th 1878 It was raining this morning so we were all the forenoon doing the work. Hatt & Mollie took supper with Win. We put up four quarts of peaches. I worked spare time on my tidy. I don't feel at all well.